This kit adds 5-amp battery charging to 1993 (ET) and newer 9.9 and 15 Evinrudeâ and Johnsonâ manual start models. To the Installer and the Owner INSTALLER: Explain the use of the battery cable terminal cover. Give these instructions to the owner. OWNER: These instructions contain information for future service and contain operating information, located at the end of this document, that is important for you to know before you operate your engine. See "Motor Operation". Keep these instructions with your Operator's Manual. Installation of this kit involves procedures that require special training for the installer. The installation may also require special tools, supplies, and/or Service Manuals and other literature. 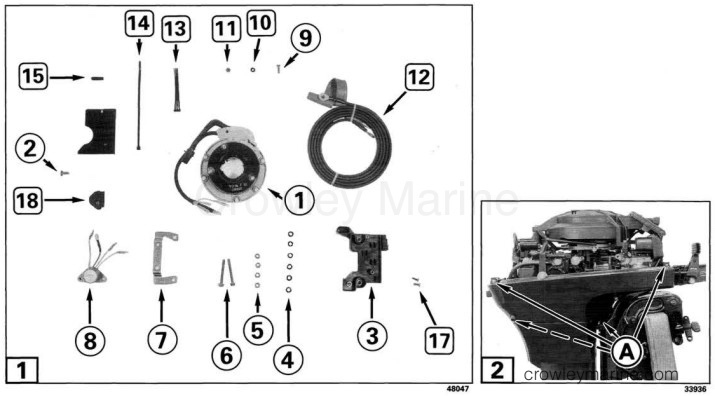 Have an Evinrude/Johnson dealer install this kit. Call-out NUMBERS (1), (2), etc. in the text and illustrations refer ONLY to the specific items in the Contents of Kit illustration and list. Call-out LETTERS (A), (B), etc. are used over and over - on different items in other illustrations. To prevent accidental starting, remove the stop switch clip and lanyard. Remove screws (A) and lower engine covers. Loosen interlock cam limit screw (A) about three revolutions. Put motor in FORWARD gear. 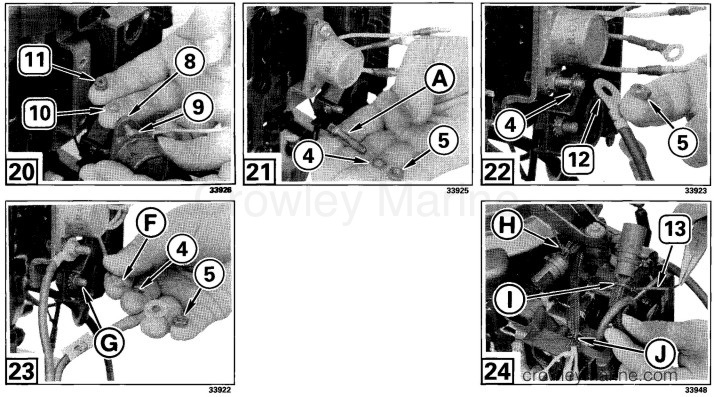 Remove manual starter screws (B). Push cam (C) back, and remove interlock rod (D). Remove flywheel. 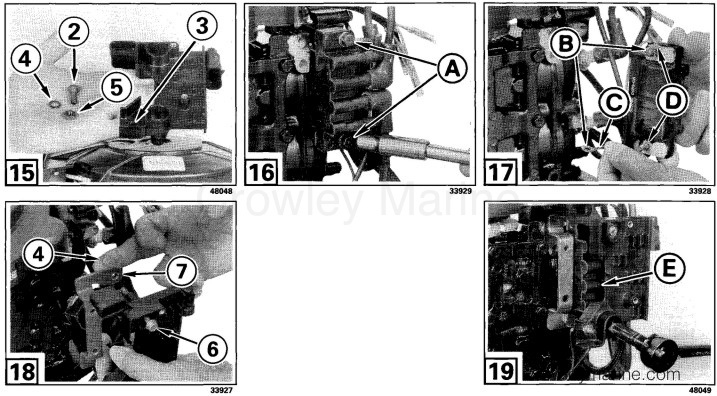 See Service Manual Section 3 - Flywheel Servicing. Remove tie strap and retainer (E). Disconnect five-pin Amphenol connector. Remove stop switch socket from "E" terminal position in Amphenol plug. See Service Manual Section 3 - Amphenol Connector Servicing. Remove complete ignition plate (F) from retainer plate (G). 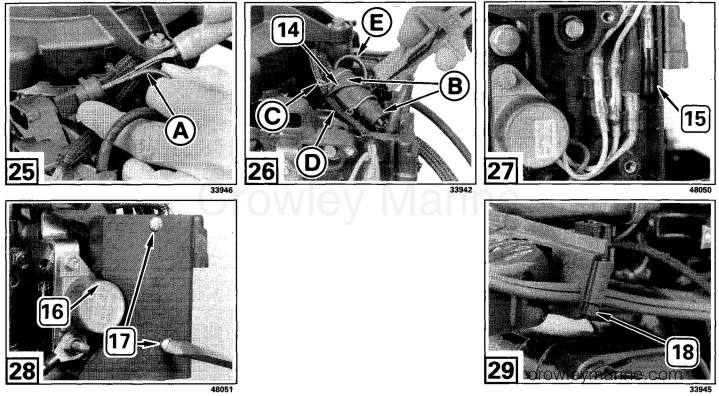 See Service Manual Section 3 - Ignition Plate Servicing. Apply Nut Lockä thread locking compound to screws in new ignition plate assembly (1). Apply Moly Lubeä to the ignition plate bushing (H). Squeeze ignition plate bearing ends (I) together and guide ignition plate down over bearing. Start ignition plate screws into retainer while holding throttle cam (J) in position. Tighten screws 25-35 in. lbs. 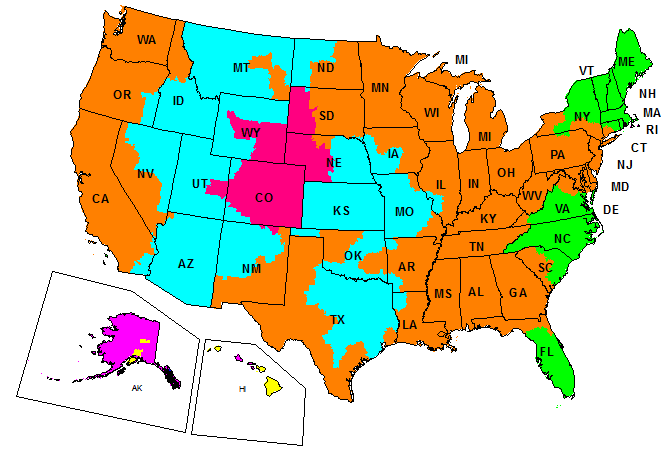 (2,8 - 4,0 N·m). Reinstall flywheel. 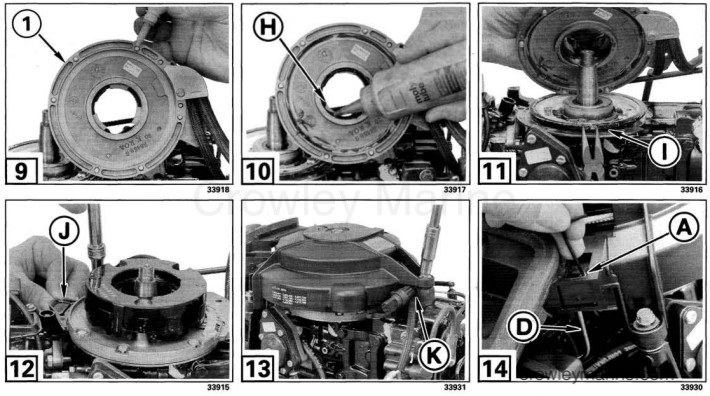 See Service Manual Section 3 - Flywheel Servicing. Route the ignition and alternator leads inside the mounting post (K), position starter on engine, and start the mounting screws. Reconnect starter interlock rod (D) (in FORWARD), shift to NEUTRAL, and carefully turn interlock cam limit screw, (A) IN. Tighten starter mounting screws to 60-84 in. lbs. (7-9 Nm). Insert 1/4-20 x 9/16 in. screw (2) from the back thru the electrical bracket (3), and secure with 1/4 in. lockwasher (4) and 1/4-20 nut (5). Tighten nut securely. Remove and save coil mounting screws (A). 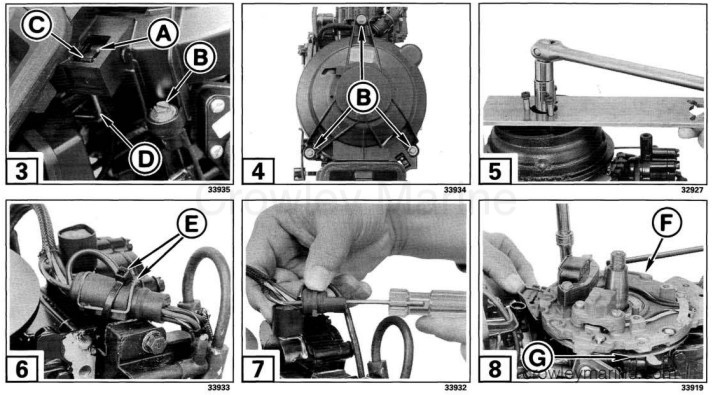 Note the position of lock washers (B) next to head, and stop switch lead (C) between bottom lock washer and coil. Fiber washers (D) must be reassembled between ground tabs and coil body. Install 1/4-20 x 2-1/8 in. screws (6) thru electrical bracket, the rectifier bracket (7), lock washers (4), and the coil (E) with all original washers, etc. in the correct location. Tighten screws to 48-96 in. lbs. (5,4-10,8 Nm). Install rectifier (8) with 10-24 x 5/8 in. screw (9) thru the top hole of rectifier, thru #10 lockwasher (10), rectifier bracket, and 10-24 locknut (11). Install one coil mounting screw (A) saved, from the inside, out thru the lockwasher (4), bottom rectifier bracket hole, rectifier, and nut (5). Tighten nut. Install lockwasher (4), the motor end of battery cable (12) black (ground) wire, and nut (5). Tighten nut. Connect yellow, yellow/gray, and yellow/blue rectifier leads to same color alternator leads. Connect rectifier red lead (F), lockwasher (4), the motor end of battery cable red (positive) lead (end without a red wire-cover), and nut (5) to terminal (G). Tighten nut. Secure woven sleeves next to the Amphenol connector at (H) and (I), and the bullet connecto9rs at (J) with small tie straps (13). Reinstall the stop switch lead (A) in the 5-pin Amphenol plug at the "E" terminal position. See Service Manual Section 3 - Amphenol Connectors. Reconnect Amphenol connector (B), and reinstall retainer (C). Secure connector, alternator leads (D), and stop switch lead (E), to coil mounting post with large tie strap (14). Fit leads neatly into electrical bracket with cap (15) on extra yellow/gray lead. Secure over (16) to electrical bracket with two #10-24 x 1/2 in. screws (17). Remove blank grommet and fit grommet (18) on battery cable and in front panel recess. Reinstall lower motor covers. Securely connect fuel hose to fuel fitting with tie strap, it removed. Check for leaks by pressurizing hose with primer bulb. Repair any leaks before operating motor. Run motor in test tank with ammeter between red battery cable lead and the battery. Alternator should produce 4.5-5.5 amps at 5000-5500 RPM. Check the stop switch operation. Stop motor by pulling stop switch lanyard. Check synchronization and linkage adjustments. See Service Manual Section 1 - Synchronization and linkage. To prevent sparks and possible fire and explosion always insert RED battery cable terminal into attached RED terminal cover whenever cables are disconnected from battery.